Asia Pacific Institute of Information Technology is one of the leading Sri Lankan private education institute in Business, Marketing and HR area. They offer various degree programmes such as. Apart of degree programmes they also offers highly recongised MBA ( Master of Business Administration Degrees too ). 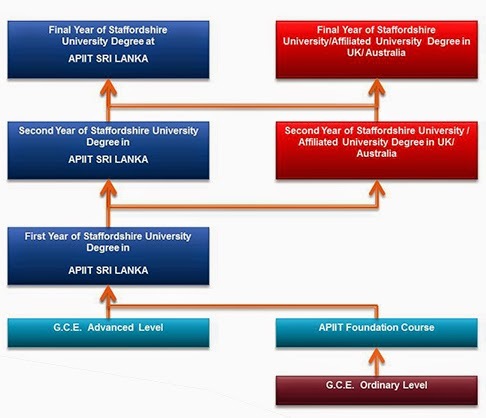 To Study Asia Pacific Institute of Information Technology Sri Lanka (APIIT) degree programmes student need at least 2 passes for Advanced Level and 5 Passes for Ordinary Level examination including credits for English and Mathematics.Path of APPIT Journey mentioned in bellow. Contact bellow for further detail regarding the courses.